'All About Presentations' by Jazz Factory: Do I really need Slide Transitions? Do I really need Slide Transitions? I have seen people use all kinds of slide transitions to keep the audience interested. From simple effects like 'Fade Smoothly' to crazy effects like 'Dissolve' and 'Strips'. They come from right, they come from left, they come from all over the place. 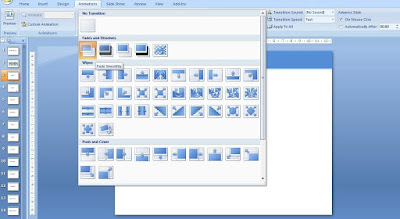 MS PowerPoint 2007 has 49 kinds of transition effects. You can also tweak the transition speed (slow/medium/fast). 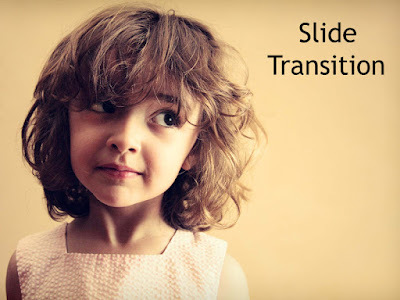 Do you really need to worry about slide transitions? What do you do when you make presentations? How often do you use transition effects? Do you experiment with multiple effects in the same presentation or stick to one? 2. If you want to then apply 'Fade Smoothly' to all slides and forget about it." Spending anything more than 2 seconds worrying about slide transitions is a waste of time. Slide transitions came into use because they break the monotony and are used to emphasize a particular slide. Now we have started misusing the effect. If you see a transition effect once, yes I agree it does break the monotony. But when the same effect comes after each slide, doesn't it become painfully monotonous. The solution to this painful monotony is not to have different effects after each slide. The solution is asking yourself "Do I really need slide transitions?" Don't use it because it's there. I recommend using 'Fade Smoothly' because it makes the transition (movement) from one slide to another smooth and eliminates the jerk. Other than this, I really don't see much value add in using slide transitions. If you really feel you need to use transition effect to emphasize a particular slide, do it. Use a different effect type (from the 49 provided). This is an exceptional case. Also remember not to make more than 2 exceptions in one presentation. It doesn't look formal and gets really painful. Remember, slide transitions cannot distract the audience from the presentation. If it is present, it should draw no attention towards itself.